May 8, 2007: Sunny and pleasant, Water temp 65* and Clear. Ran uplake at 4am to catch bait and picked clients up at High Point at 6am. It was frosty this morning so I made just a short run to a 10' to 20' flat and set out planner boards. I only got 3 out before the action started and it took me a couple of hours to catch up and get my spread out. We made several passes on the area before taking a pitt stop. Went and caught more bait and found a area that was holding Stripers near the bottom in 20' of water . I set out 10 boards and a downline and we started getting hits again. After the action slowed a little on boards I went to downlines and finished out the day. 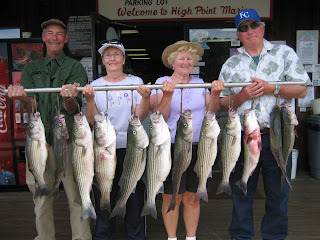 We had 37 hits today with my clients keeping 13 Stripers. I believe the ladies will have bruised bellys after reeling in the fish tomorrow.